15834 Jessamine Road Dade City, FL. | MLS# E2204379 | Real Estate Sales & Property Mangement in Dade City, San Antonio, Wesley Chapel, Brooksville, Homosassa, & Bushnell. 18 ACRE HORSE FARM! 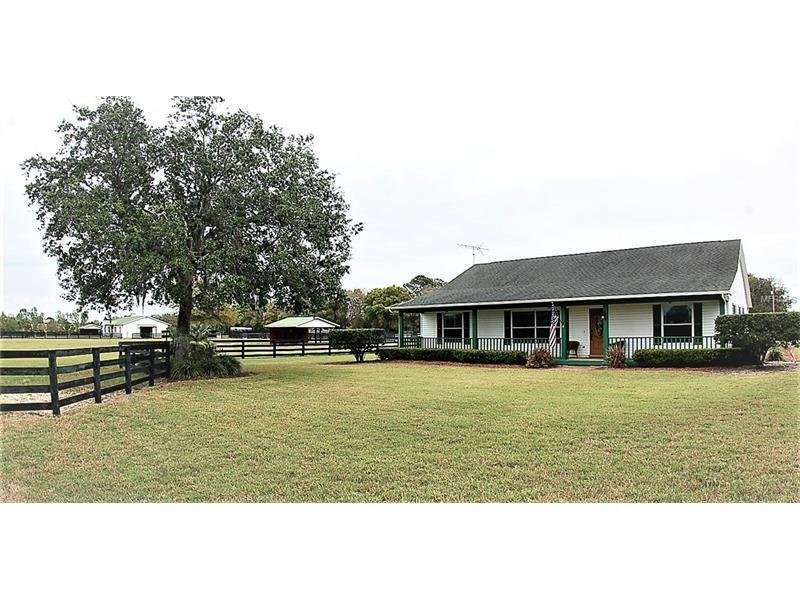 This immaculate farm is located in rolling hills of the San Antonio/St. Joseph Area of Dade City. The custom home is a 3 bedroom 2 bath home with 2x6 frame construction and double pane windows. It is a Great Room plan with a beautiful vaulted pine ceiling, wood cabinets in the kitchen with granite counters and back splash. The master bedroom is a nice size with two walk in closets and a master bath with jacuzzi tub and large shower. Trane 3.5 ton A/C system was installed in 2015, new 5HP well pump in 2015, roof was replaced in 2004. The pasture is planted with Argentine Bahia and has 5 paddocks with 4 run in sheds, 3 are 24x24, one is 16x16. Each paddock has automatic waterers all with 4 board fencing. The barn is 38x72 concrete block with a metal roof. There are 7 stalls, tack/feed room with a/c, 1/2 bath, wash rack (hot water available), auto fly system. All of the stalls and the alleys have 3/4" rubber mats over concrete. There is also a horse walker, loading ramp and 55' round pen. This property is turn key and ready for you to move in!